Rev. Msgr. S.M.GEORGE, the Founder of Kalai Kaviri Cultural Undertakings, is a Pioneer and Trend-setter in the promotion of Fine Art Forms, and has made historical and indelible impressions on Indian Cultural promotion. His globally-acknowledged and monumental contributions in promoting the Fine Arts of our sacred land, realized through his vision, creativity, genius, commitment and prophetic perspective, made him unparalleled. His outstanding manifestations of Art in every expression, in visible forms of cement and mortar, in human resources and in invisible forms of value-based quality, speak for the power of human spirit. As a pedestal for his visionary goals he founded ‘Kalai Kaviri’ the Arts & Communication Centre in 1977 and maneuvered through his strategy. Rev. Msgr. S.M.George effected a unique revolution of bringing the prestigious Indian fine art forms, which were once the pride of only the elite and the rich, to the access of the common man, also proving that the socially less-privileged are equally talented and deserving. … with Dr. M.G. Ramachandran, Former Honourable Chief Minister of Tamil Nadu – 1982.
then Honourble Chief Minister of Tamil Nadu. Eager to promote the traditional arts through systematic training, he founded KALAI KAVIRI SCHOOL OF FINE ARTS offering systematic and personalized Part-Time training in Bharathanatyam in 1983 and in South Indian Classical Music in 1988, for school-going children. Further, Full-time Dance Courses and a Music School offering Part-time Courses in South Indian Classical Music were started in 1988. In 1990, Full-Time Bharathanatyam Diploma Course was affiliated to the Bharathidasan University which authentically recognized the high standard and quality of training offered here. Affiliation to the full-time Vocal, Veena Violin and Mirudangam Courses by the Bharathidasan University followed in 1992. 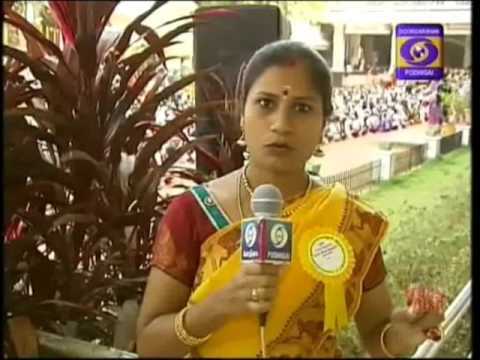 The full-time Post-Diploma Course in Bharathanatyam also was affiliated to the University in 1993. … with Shri T.M. Soundarajan, Cine Play -back singer. The State poet of Tamil Nadu. He gave free training to deserving and talented children. Children from all economic and social categories, specially children of vendors, daily-wagers, cobbler, tea-shop keepers, washer-men, fishermen, children from suburban villages and handicapped children came forward to learn dance and music, in the Part-Time courses. This empowerment of these groups of students, is a historical and uphill task in our society. A number of Dalit students who passed through the portals of Kalai Kaviri would bear testimony to this historical reality. This is a Silent Revolution – a Socio-Cultural Change. Beyond the Gurukula tradition of many centuries Rev. Msgr. S.M.George obtained academic authentication of university degrees for the Indian fine art forms to the level of doctoral studies, the highest peak of academic excellence. Over centuries the Indian Fine Arts are taught to the students only through Gurukula system. This system exists in very few places and there has been a dearth of patrons or gurus to keep alive these most precious art forms. Rev. Msgr. S.M. George, in order to perpetuate these art forms, brought them into the academic realm of University Education and started KALAI KAVIRI COLLEGE OF FINE ARTS in 1996, offering Degree courses, approved by the Government of Tamilnadu and affiliated to the Bharathidasan University. He was the Secretary & Principal from 1996 to 2003. Transcending the Gurukula (non-formal training), he elevated Bharathanatyam, the classical dance, to a unique academic status of Ph.D. programme. Kalai Kaviri is the only full-fledged College of Fine Arts in the Southern region of the country, founded by Rev.Msgr.S.M.George, that has launched Ph.D. Programme for Dance (Bharathanatyam) – the first of its kind. Opening up opportunities and facilities for Doctoral studies for Bharathanatyam, is an academic innovation in the field. This is a matchless march by the minority community towards this point of culmination in Fine Arts. Rev.Msgr.S.M.George enabled the art-lovers all over the world to qualify with university degrees in the fine arts of ‘Gurukula tradition’, from wherever they are, by evolving a unique course-concept of distance mode of training, THE OFF-CAMPUS DEGREE PROGRAMME IN BHARATHANATYAM, for which he was the Director from 2004 to 2008. It is another major and giant leap in continuation of the Cultural Mission initiated by Rev.Msgr.S.M.George in 2004, taking the package of training and faculty beyond the confines of the college campus to each art-lover in any part of the world, wherever they are, whether employed or undergoing other courses or at home and enable them to gain university degrees in this prestigious Indian art of Bharathanatyam. Age is no bar. This is offered by Kalai Kaviri College of Fine Arts in collaboration with the Bharathidasan University, Tiruchirappalli, using new skills and modern technology in teaching Bharathanatyam. Rev.Msgr.S.M.George brought out very powerfully and beneficially the communicative dimension of the Indian art forms and their perennial share in elevating the urges of the people. Rev.Msgr.S.M.George removed the illusion of ‘Art for Art’s sake’ and established that they primarily have a social re-creative nature. The performances of THE DANCE TROUPE that he constituted in 1978, are an on-going and unique revelation and mission underlining the communicative scope of Indian dance and music for the spiritual and social betterment of humanity. The virtuous message of Love, Peace and Solidarity, given through the various classical and folk dances with a blend of electronic media, have penetrated the hearts of people from all walks of life, people of all age groups, belonging to different linguistic and ethnic groups all over the country and in the different foreign countries, and influenced their attitudes for better. Rev.Msgr.S.M.George inculturated the biblical values through literary works as well as dance and music compositions, enriching the religion and the culture mutually. The major and historical contribution of Rev.Msgr.S.M.George in the field of Tamil Literature is “Yesu Kaviam” an epic of eminence (the Life of Christ in Tamil), published by Kalai Kaviri. Written by the renowned Hindu Poet Laureate Kavinger Kannadhasan, the epic has seen six major editions with 3,08,000 copies. It has drawn the attention of the entire Tamil-speaking world and is used as part of the syllabus in schools, colleges and universities in India and even abroad, and taken up for research by M.A. and Ph.D. students. Convinced that the Indian art forms are based on spiritual experience both for the performer and the perceiver, Rev.Msgr.S.M.George introduced Indian Music and dance as part of the Christian liturgy (worship). Rev.Msgr.S.M.George, well aware of the impact of the electronic media and the power of music as a medium of communication with God, produced Christian songs in classical and semi-classical music based on different traditional styles like suprabatham, thevaram, keerthanas, etc. He also brought out the entire life of Christ in 114 folk songs “nattuppura isaiyil namma yesaiah” recorded in 25 audio cassettes, to show the importance of folk art forms for the mission of the church. … with Padma Vibhushan Dr. M. Balamurali Krishna, Exponent in Carnatic Music. … with Shri M.S. Viswanathan, Cine Play -back singer. … with Thavathiru Kundrakkudi Ponnambala Adigalar, A Hindu Religious Head Tamil Scholar. According to Rev.Msgr.S.M.George, a cultural institution should be a monument of cultural beauty in its structure also. Hence, he conceived, designed and built Kalai Kaviri’s main building as an Indian architectural marvel, with a face-lift of life-size statues of Indian classical and folk dance postures, Christ on the cross as well as the risen Christ represented in Bharathnatyam, in the front elevation. The main building and the departments of dance and music and the open-air stage are built with Indian temple elevation, the sthapathy art work in the building, tall pillars and the roof. Rev.Msgr.S.M.George instituted a Drama Team in 1982, which gives dramas on social awareness and spiritual awareness themes, basically staged in rural areas and also in educational and public institutions. He started giving ‘Kalai Kaviri Awards’ from 1989, to be given every year for talented and deserving artistes who live in obscurity, in order to honour them in recognition of their dedication to fine arts, literature and other creative fields. 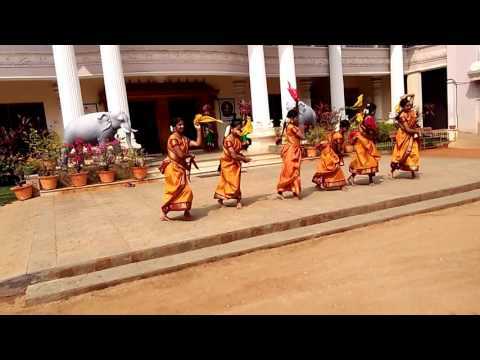 ‘Kalai Kaviri Rolling Shields’ instituted by him in 1990, to be given every year to deserving schools for distinguishing themselves in Fine Arts like dance, music (vocal and instrumental) and drama in order to encourage the students to utilize their talents for noble purposes. The trust and confidence that Rev.Msgr.S.M.George built up in the minds of the people of the city of Tiruchirappalli, is such that “the Thirukkural Peravai (Association) consisting of many Tamil scholars, made him the president of the Association. As an effort to promote ‘Thirukkural’ the Tamil literary work of highly valuable ethical codes common for all religions, written by Thiruvalluvar the great Tamil sage, he conducted a memorable three-day Conference “Thiruvalluvar Festival” in January 1992. Symposia, Seminars, Debates, Elocution Contests etc. were the various high-lights of the conference. Tamil scholars from all over the state attended it. His mastermind, achieved his visionary goals of unparalleled glory in the field of Fine Arts that will go down in the history of Indian Cultural Heritage. 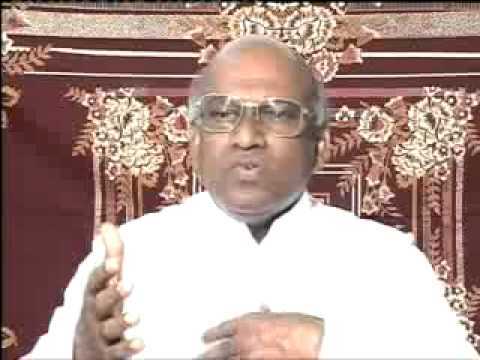 He always believed that the “Best is Yet to Come” and before he could realize many more of his glorious dreams for Kalai Kaviri, Rev.Msgr.S.M.George passed away on 20th October 2008. With his spiritual guidance, Kalai Kaviri will proceed diligently with deep commitment, in the path he paved for promoting the Indian Fine Art Forms. Conferred by the Rotary Club of Tiruchirappalli. Conferred by the Thamaizhaiya C.V. Kumarasamy Pillai Kalvi Kazhagam (Tamil Scholar C.V. Kumarasami Pillai Education Trust) on behalf of ‘Sarkarai Nadar Endowment’. Conferred by the Tamil Nadu Arya Vaisya Magalir Samajam. Conferred by the ‘India Economic Development and Research Association’ and the India International Council for Industry and Trade. Conferred by the Chairman and members of the Steering Committee and the President and members of the Lions family of Musiri. Conferred by Adhithanar Muthtamil Peravai, during the 97th Birth Anniversary of Late Veteran C.P. Adhithanar. Conferred by the Lions Club of Madras Cathedral. Conferred by Thanthai Periyar Muthtamil Mandram, Chennai. Conferred by the World Thirukkural Conference and the people of the city of Tiruchirappalli. Conferred by Autchelvar Pollachi Mahalingam, on behalf of the Educational Trust of Sakti Group of Educational Institutions, Pollachi. Conferred by the Holy Father Pope John Paul II for the meritorious service he has done to the World Church through his cultural mission in India. Conferred by Mr. Marc Aellen, the Secretary General of Signis / World on behalf of Signis / India, during its 33rd National Assembly held in Vailankanni.